With festivities such as Thanksgiving and Christmas merely looming around the corner, our thoughts begin to dwell on holiday gatherings that generally center around a shared meal. Make this holiday season more than memorable by opting for a tablescape that will provide a tactile feast for the eyes (And the mouth too). I admit, I can't help but feel like a bit of a hypocrite by providing such advice, considering I can't really remember the last time I actually sat at the dining table... the couch is just so much more convenient and comfortable. But, as the saying goes: those that cannot do, teach.... right? Today we have a sampling of advice and guidance regarding tablescaping, brought to you by yours truly, that I like to call: Steve's Steps to Tablescaping Success! 1. Forego the blank canvas. 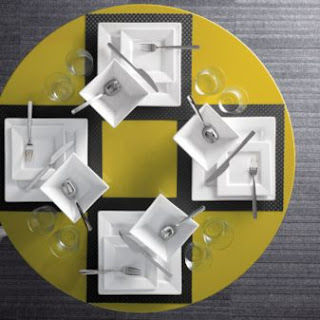 A well balanced tablescape begins with a bold splash of color- something out of the ordinary! Roll out a saturated table cloth or table runner for a color pop to layer other table elements upon. Choose textiles that you love, that are versatile enough to be used for multiple gatherings in various seasons. 2. When in doubt, choose white. I realize that this may seem contradictory to the last piece of advice, but for your core pieces- mainly plates and universal serveware, choose white. Also, Chargers are our friends. 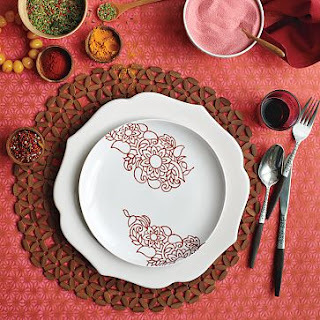 Use them generously, as well as decorative napkins, to inject color and texture. Also, don't be afraid to mix things up: try using a variety of dinnerware for your guests, rather than making every place setting identical. 3. Incorporate an element of nature. For a Fall tablescape, the entire expanse of table does not need to be covered in layers of leaves. Rather, use natural elements sparingly, but in intentional areas to promote a feeling of authenticity and simplicity for diners. Try a simple vase filled with branches with leaves in tact, gather some fresh herbs and spices, or use large, smooth stones as trivets for hot dishes. Or, strategically place small bowls filled with water, centered down the table, with a lone flower floating in each one. 4. Use centerpieces to center the attention. Centerpieces- candles, vases, and accent pieces will drive focus and ground the viewpoint of guests. However, beware of choosing centerpieces that are too high, large, or gaudy. A centerpiece that blocks or constricts the conversation will quickly defeat the purpose of the gathering. 4. Don't forget the bling! Crystal champagne flutes, or embellished napkin rings will add instant sparkle and dazzle to the tablescape. Especially when paired with tea lights and candlesticks, metallic and sparkly elements will set the table aglow and create an ethereal environment, prime for deep conversation and hearty laughter. 5.Most importantly: The table should say something about the host. Don't be afraid to inject your own personal style or flair into the tablescape. A tablescaping task can become daunting, but do what comes naturally to you, and go with your instinct. placed on top of a punch of color!